Move out of a rut and reach your goals with our five helpful tips. Consider these five tips for blazing a trail to your best life. Create a picture for yourself of how your ideal life looks. Be clear about what you really want in life and write a list of the things that matter. Be aware that if your finances are disorganised it can be easy to stay in a rut without realising it, just to keep afloat. It’s easier to make change when your finances are laid out in front of you. Then you can understand where your money’s going and where you can make changes. Most big goals are a series of smaller milestones. Break down your overarching goals into individual steps and you’ll create a plan for reaching them. Set dates for each milestone and mark them off your list as you achieve each one. You’ll generate natural encouragement for yourself as you reach each milestone and you’ll keep the momentum going. Thinking differently is often easier said than done. Help yourself change the way you think by finding the positive effects of each milestone you’ve set and aim for those. By focussing on the positive, you’ll head towards what you want instead of putting off what you’re telling yourself you should do. Take account of any fears you may have too―about failure or success―and work towards taking action anyway! Be prepared to make mistakes and understand that it’s all part of the process. Studies show that people who forgive themselves for making mistakes along the way tend to have more overall success.i So don’t be hard on yourself. Just regain your focus as soon as you can and stay with your plan. We’re here to help – we can help you manage your money and stay on track to reach your financial goals. 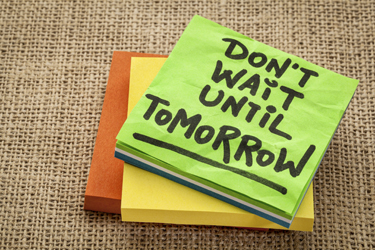 You can beat procrastination slowly and surely. Chances are, in a relatively short amount of time, you’ll look back on a self you don’t even recognise!